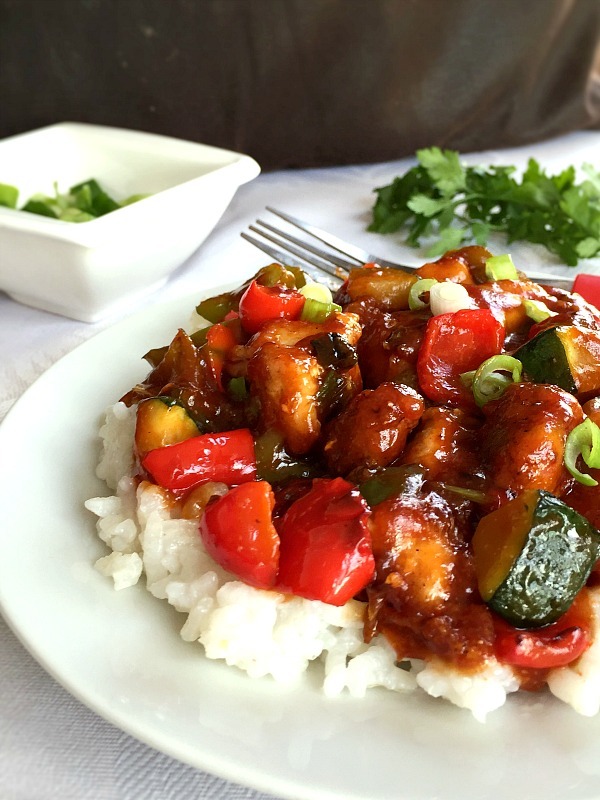 Healthy Sweet and Sour Chicken with vegetables, a tasty dish ready in about 15 minutes. So much better and a lot healthier than any take away. Serve it with rice or noodles for a truly Asian feast. A low-carb, high-protein dinner. I went to a restaurant the other day where they have a some sort of buffet with dishes from different cuisines. Their sweet and sour chicken looked so delicious, but when I tasted it, my happiness went right down the drain. The sauce was way too sour, the chicken way to greasy, and the veggies were nearly raw, rather than nearly tender. It’s safe to say I was not impressed at all. So, that’s how I decided I would have a better experience with the sweet and sour chicken next time. And my home-made version is so much healthier, and tastier too. 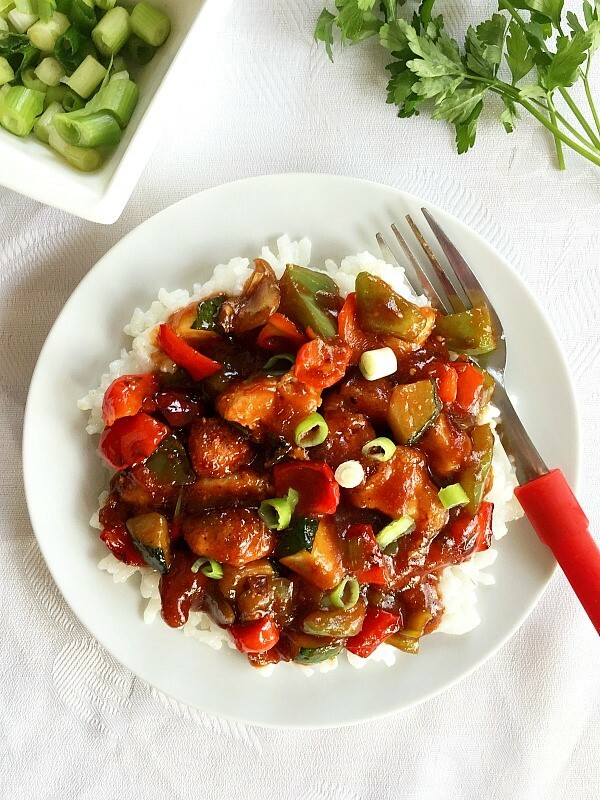 How do you make the best sweet and sour chicken? Stir frying is not only quick, but healthier too. The veggies keep their colour and shape without being overcooked, and the chicken is cooked to perfection. First, start by cooking the chicken. Add the cornflour (cornstarch) to a bag together with a bit of salt and pepper, add the cooked chicken and shake well to coat evenly. Heat up the oil in a pan, add the chicken pieces and cook until tender, then remove the chicken from the pan and wipe the pan clean. Add a bit more oil to the same pan, throw in the spring onions, garlic and ginger, and cook for a few seconds to release the flavours. Add the chopped vegetables and stir fry until the veggies are cooked, but not too soft. The cooked chicken can now be added too. The best vegetables for sweet and sour chicken are peppers (green, yellow, red), courgettes (zucchini), although anything else goes too. How to make the best sweet an sour sauce? Once the chicken and veggies are cooked, it’s time we made the sauce. Use a different pan for the sauce, so it can cooked beautifully. Add the ketchup, soy sauces, sesame oil, vinegar and sugar, and stir well. Use one tablespoon of cornflour with 2 tablespoons of water, then pour the mixture in the sauce, and cook gently over a low heat until the sauce thickens a bit. The chicken and veggies will now be added too, and toss around to be well coated in sauce. Garnish with spring onions, and that’s your dish ready. There are lots of recipes out there for sweet and sour chicken (or any other meat). Some of them use fresh or canned pineapples for that sharp, yet sweet taste. But l think l prefer using only vegetables and then add ketchup, sugar and vinegar. Somehow, fruit in meaty dishes are not my thing. Healthy chicken recipes can made dinner time so easy, especially if they are quick and ready on the table in no time. And this dish is no exception. So, there you go, your own Asian dish ready in no time. 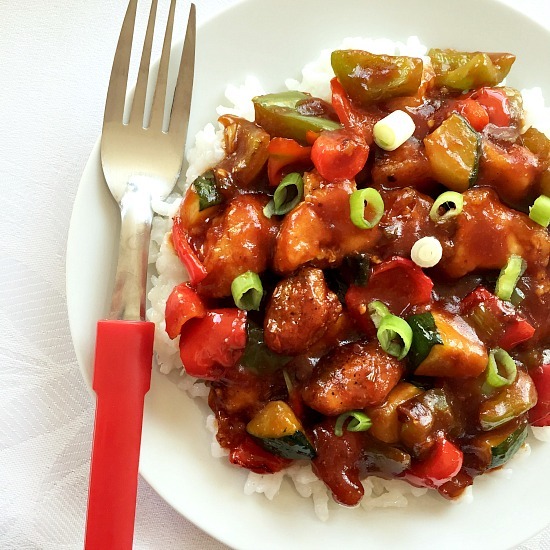 If you’ve liked my HEALTHY SWEET AND SOUR CHICKEN WITH VEGETABLES or any other recipe on the blog then don’t forget to rate the recipe and let me know how you got on in the comments below, I love hearing from you! You can also FOLLOW ME on FACEBOOK, and PINTEREST to see more delicious food and what I’m getting up to. 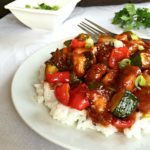 Sweet and Sour Chicken with Vegetables, a delicious Asian-inspired dish that tastes so much better than any take-away. A fantastic sweet and sour chicken sauce, and fluffy rice, this is one healthy chicken dinner for everybody to enjoy. Place the chicken in a bag, add one tablespoon of corn flour, a quarter of a teaspoon of salt and the ground pepper and seal the bag. Shake it well so that the chicken can be coated evenly. 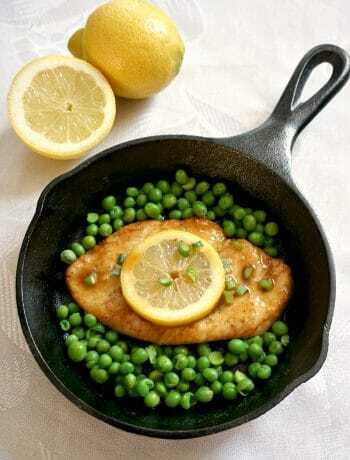 Heat up two tablespoons of oil in a pan, add the chicken and fry until brown and cooked through. Peel and grate the garlic cloves and ginger, chop the spring onions and add them to a wok together with half a teaspoon of oil. Stir for 30 seconds, then add the vegetables chopped roughly. Stir well for about 5 minutes, so that the vegetables can soften. A high heat is recommended when stir frying. In a separate pan, combine the ketchup, soy sauces, vinegar, sugar and sesame oil. 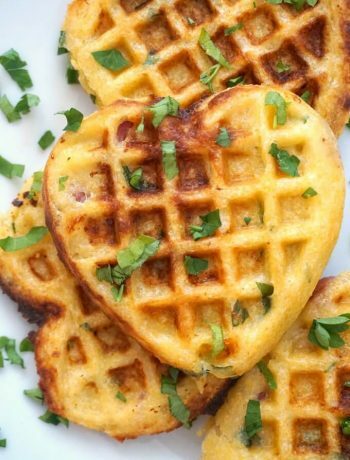 Mix one tablespoon of corn flour with two tablespoons of cold water, then add the mixture to the pan. Stir gently on a medium heat until the sauce thickens. Pour it over the vegetables, add the cooked chicken and mix well. This has got to be one of the most colourful and attractive dishes I’ve seen for a while.And it sounds delicious! I enjoyed reading about your visit to the restaurant and how it inspired you to create your own recipe. Thank you, Millie! 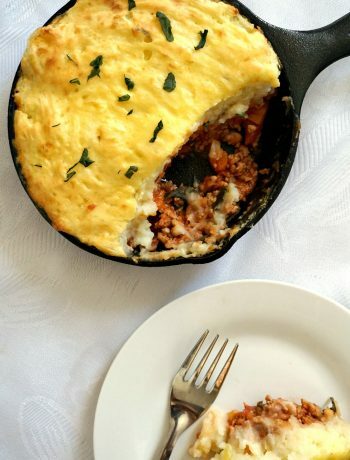 It’s a nice dish and easy to make. Sometimes l wonder what else to cook, and it helps that l’m always happy to try different dishes.